The Integrated Development Environment also known as IDE is used for writing, reading, viewing and process programs. The best IDE for angular 2 or the latest angular version 4.0+ is dependent on some factors. If you preferred a particular IDE effective for a framework or program, it does not it would for another. The overall benefit of a particular IDE viz-a-viz a program or framework like angular 2 is based on how easy is to for the programmer to use. Angular 2 codes are typescript, html and css based. The syntax are quite unique and a number of extensions and plugins have been developed on various IDE’s to support Angular 2. The basic features of the IDE’s listed as the best for Angular 2 is good for beginners, while advanced features are available for experts and pros. Third party extension and plugin integration. The factors above are all important, however some IDE’s have more advantage than other in some areas and aspects. Below we list the best IDE for Angular 2 and the latest Angular 4 in order of preference. 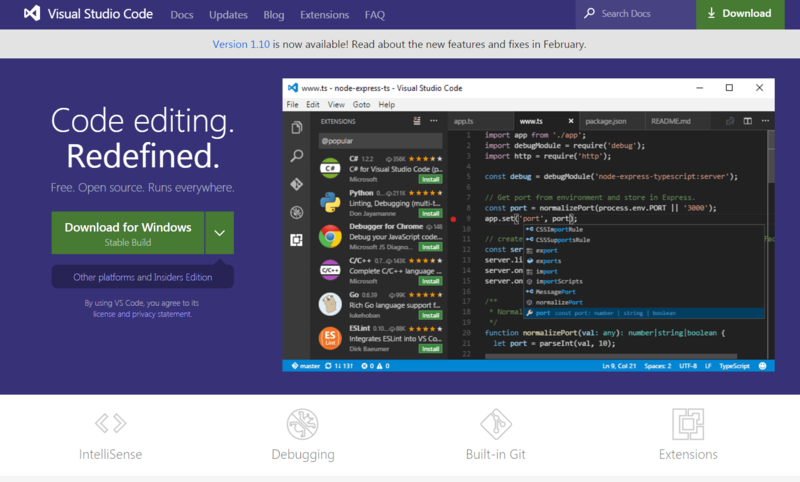 Visual studio code stands on top of the best IDE for angular 2 and angular version 4.0, the IDE is probably the best product from Microsoft. It has the best community and internal support, with contributors adding extensions, themes and suggestions. The best part is that it comes free at no cost for developers. Most Angular 2 and Angular version 4.0 tutorials features visual studio code as their preferred IDE. This is not because they cannot use other IDE’s but Visual Studio Code provides the ease required to write angular 2 and angular version 4.0 codes. The secret behind its effectiveness is that the developers of Visual studio code have a strong interest in typescript, and it comprise of developers from Google who developed angular and the typescript developers. It is also a cross platform IDE it works for Mac, Windows and Ubuntu. Visual studio code highlights errors, it also recognizes angular syntax. The extension community is quite large and they have developed tools to complement angular. On the selection factor visual studion ranks very high. You will find it very useful and helpful to use for your angular project, however take time to understand the application. This is by far one of the lightest IDE, it is very good to use with your angular projects. It is said to be developed and managed by GitHub, the IDE is very git friendly and also supports typescript. Users can download Angular Typescript Package, and get the necessary steps syntax support. Like most IDE’s it has a flexible interface and design, error highlighting and angular typescript syntax auto complete. The beauty of Atom is that it can be customized to the very core of the application. The reason why it is not number one is that it has fewer contributors and the application crashes if the IDE cannot handle issues. This is an IDE that programmers love, it is similar to Atom in many ways, however it has packages. Sublime has a good support, and is available for Mac, Windows and Ubuntu with interface manipulation and debugger. However sublime has limited support for extensions and plugins for angular 2 and angular version 4.0. The very beauty of sublime is the typescript debugging feature, and the intellisense for HTML. This autocomplete angular based application and typescript. The challenge it has is with the high processor and memory usage, also it is a paid service. You need a license to run webstorm, it is available for Windows, Mac and Ubuntu. It is regularly updated and a good community exist for webstorm. This IDE is built for angular, it fully supports angular and designed by the makers of Eclipse. It comes as a standalone IDE or as part of the Eclipse Plugin. The Angular IDE by Webclipse supports HTML, Angular and Typescript. It has angular CLI integration and the latest features update of angular. Below are some of the features as listed on the official website. Up next is the best IDE for Node.js. The support you get from your IDE will help you write better codes with efficiency and effectiveness. It is up to you, tell us your best IDE for Angular 2 and Angular version 4.0. This post was published by a Patmos Edu Staff for » Patmos Edu. At Patmos Edu, we provide a complete career and educational resources with insights, tips, and guides.